Education: Faculty of Politics and Economics at the University of Takushoku in Tokyo (TAKUSHOKU UNIVERSITY) (1956-1960). Director of the Permanent Japan Aikido Federation. Director of the Japan Budo-Council. Technical adviser to the Japan International agency. Inspector General of the Japanese Association World Games. Permanent guest instructor Netherlands Cultural Aikido Federation. 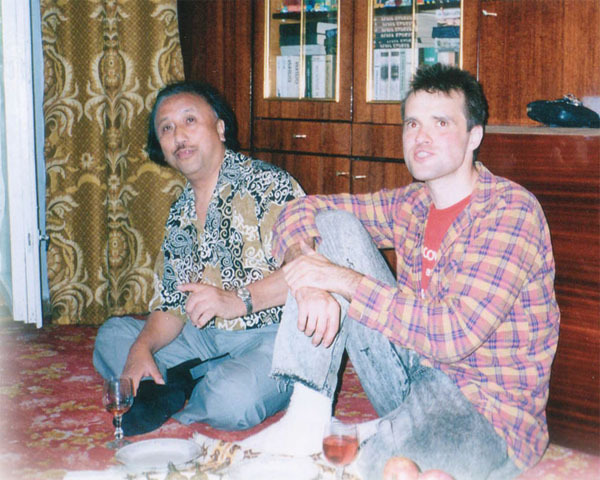 First time I saw Masatake Fujita in Romania in 1995 I was presented Fuji Peter Bakas, 5th Dan, Secretary of EAF (European Aikido Federation) and said that from this day Masatake Fujita my teacher and technical director Aikido Federation of Moldova. Objections and suggestions were not accepted. It was the first Japanese, and also Japanese that rank, which I was able to hold out plenty on the, and which I can communicate live with, not as with some demigod, in that believe that he where that exists, but as a real person, a real flesh and blood, and at the same time fantastic and unreal, that I could not believe that this is happening to me. The first training and I had the opportunity to attack him. I grabbed his arm, and I have the feeling that I'm holding a huge and strong catfish. I felt no resistance to his power, but no matter how much I have tried to hold, fix it, he slipped away like a huge slippery fish. And then I felt the first time that what power is. I already had experience of sparring with a Japanese instructor, the feeling when you throw a master, but I was stunned Fujita. Michael Kozmeya, my friend and student at the time, who came up to me to learn aikido from Romania, which is 10 -15 degrees of rotation, he is imprinted on the tatami in Irimi Naga, that he was coughing a week. And at the same time I could not then fully appreciate the skill Masatake Fujita. I was delirious when a beautiful, spectacular Aikido. Christian Tise, with his efficient and perfect technique was ideal for the who involved thousands of aikido in the FSU. By comparison, Masatake Fujita did not have the beauty and elegance of movement, also made a bunch of confusing to do and unnecessary (as it seemed then) exercises. Well done, 8th Dan, Hombu Dojo Secretary-General ... Yes will be my teacher, I will pass exams him, and I will take the technique, somewhere on the side ... Business is in that by the time we were already spoiled by the Japanese instructors of high rank. Europeans for us in general presented no interest. Christian Tise was the only exception. Fujita so Fujita thought I... And the only time I was able to appreciate what Masatake Fujita. As time went on, I practiced and my skills grew but I ran into a problem that as well I do not do the technique, it depends on my Uke how good my uke, and how well my Uke attacks me. When I got the "bad" Ukyo, I immediately felt uncomfortable and could not show the technique so I liked it. Explanations of the same "what you should do so, because if you do not do so, I will do so," no longer satisfy me. Uke is free and has the right to behave as he wishes. My task to do the technique on any Uke. Besides, why to teach a technique calculating on geared-up (correctly reactive) Uke? I began to search reason of it, tried to understand how this problem decide different instructor of Aikido. And I growingly had suspicion that in any way.... In the place of it they engaged in that was taught by Uke correctly to behave, so, that it was then easy them and comfort to give up him. It turned zombie. My ten years, zombified by me Uke, falls splendidly, and I can on him be up wonders of technique. Not give God to me will get stranger Uke, which does not even interfere with me, but does not simply understand, what I want from him. All my beautiful technique that turned into a misery .... All this has become my cause rejection. I could not look at such Aikido and did not want to engage in such Aikido. Fujita technique is different. It is not that spectacular. Without depending on behaviors of Uke, she is always identical, she is always real. Masatake Fujita, told never and enybody, how to hold him and correctly to behave. He just took and did. And he does not care who and how he was holding. Novice or master heavy or easy. His Айкидо was not beautiful, it was effective. Effective in any. I needed the years that I was able to understand and appreciate it fully. Speaking about Fuji Sensei, I can not say about him as a Master and Man. Teacher and Man with which it was possible to be at one table (or simply on the floor) to communicate, which, in spite of precipice in status between me and sent by itself to me new-year greeting-cards, which presented to me paper cranes on happiness, personally done by his wife and which with trembling I keep 15 more than. He always was simple in a commonunication and did not build from itself an inaccessible deity deigning to you to give a glance on itself or allowing to drop to his feet. There are people who say that their teacher is a very large master and respected Master. Teacher, which they saw meters for fifty times five in life, and at which they never were Uke, and which never personally remedied them and did not explain to them a technique. Maybe I can say that my teacher, Jesus Christ. It's great to have such a great teacher. But does Jesus Christ know, that he has such remarkable student as I? 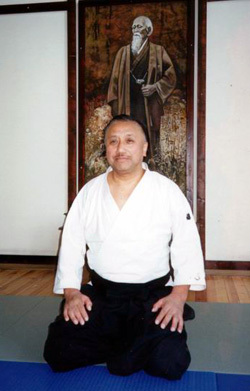 I am proud to say that the Master of Aikido Shihan Masatake Fujita, is my teacher, friend, and a wonderful person.